In Virgin and Child with Saint John the Baptist and a Female Saint in a Landscape, Mary looks down with a resigned heaviness. Pictures sometimes become devotional objects or pilgrimage destinations. Their contents have the feeling of secular-sacred spaces. The room called the Living Hall in New York’s Frick Collection houses several robust portraits, Titian’s force-of-nature Pietro Aretino among them. But the image visitors get stuck on is Giovanni Bellini’s St. Francis in the Desert. I know New Yorkers and out-of-towners alike who go to the Frick to stand with practiced reverence before it. Emerging from his wilderness hermitage, Francis steps into the light with outspread arms (posed, some think, to receive the stigmata) and from the lower right corner where he stands a sleek spatial energy bells up and outward to encompass rocky landscape, animals, a Bellini-blue sky (a cerulean violet-green), and in the distance a city, the culture of civilization that heroic, pious solitaries aspire to saturate and shape. It’s the kind of expressiveness you want to inhale into your life-spirit, if you believe in such a state. Bellini’s Francis and his expansive scene can leave you flush with praise, psalmic praise, a grand tumble of awe, unreason, and joy. Book of Hours for Denise Poncher. One blade curls around Denise’s head like a dreadful lure. What is a secular-sacred site? 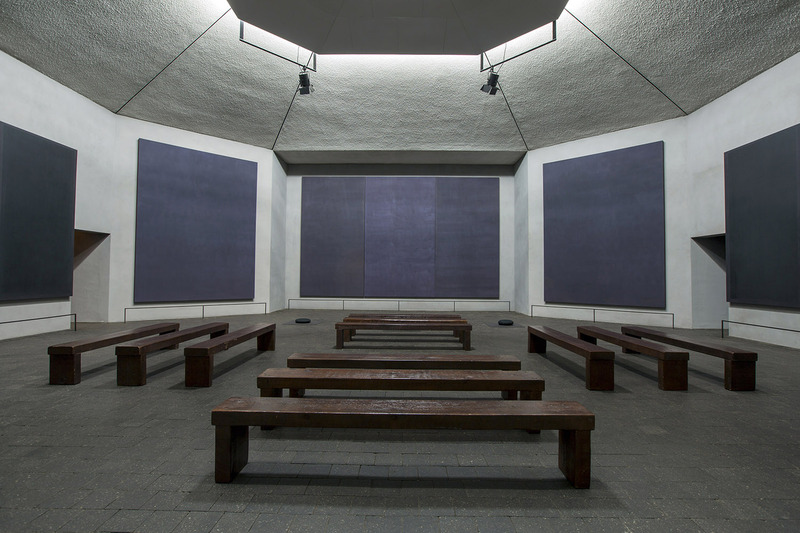 Many visitors to the Rothko Chapel in Houston, designed to be a non-denominational meditative space, find it a spare, quiet, but not churchy place crafted to encourage one to confront one’s being, in the moment, in the world, in whatever atomic scheme of things one believes in, watched over by the dark druidic presences of Rothko’s pictures. In traditional Christian iconography, wastes and barrens and gardens become holy stations where transcendent events transpire: a hermitage, a road to Damascus, a wedding hall. But in our secular lives nearly any place can become such a zone: a soup kitchen; a luxe living room; a subway car or café; riverside, wood, hilltop — fraught hollows where we may consider the world and its consciousness. Time alters. A moment, once we’re in our contemplative head and heart, becomes a mysteriously stretched zone of vision, maybe exaltation. We don’t want it to end and in that moment of resistance we also know it must. Bellini’s St. Francis in the Desert. New Yorkers go to the Frick to stand with practiced reverence before it. I’m thinking on these matters because of an exhibition at the Getty Center, Giovanni Bellini: Landscapes of Faith in Renaissance Venice (ends January 14, 2018). In the decades leading to the extreme eruption of genius (Titian, Tintoretto, Veronese) in 16th-century Venetian painting, Bellini was the most sought out painter of small-sized devotional pictures. Well-to-do patrons, of which there were an increasing number in Venice’s world-dominating maritime economy, commissioned private images — a Crucifixion, a Madonna and Child, a sacra conversazione convening three or more holy presences, a Jerome in the wilderness, a Francis in his hermitage — to serve as contemplative objects and occasions for prayer, which may be simply an act of extreme attention, or a self-preparedness for an (unanticipated) answer from Deity, or, as the poet George Herbert wrote, simply “something understood.” To consider a garden or landscape in a Bellini picture was to consider the various expressions of virginity, chastity, purity, and divine order, not just in the natural world but in any disordered or beseeching heart seeking respite, clarity, harmony. Crucifixion with the Virgin. Bellini’s interest doesn’t lie so much in sacred story as in the streaming of life behind the Passion event. Bellini was born in 1435 and came of age training and working with his famous father, Jacopo, when influences from Florentine painting and its passion for draughtsman-like clarity of structure and color were being met by the northern influence of artists like Dürer and their insistent naturalism, especially in their representations of nature. Bellini was also born into a world of one sort of artistic practice and left the world (in 1516) in another. For many years he worked in the medium of quick-drying egg tempera on a wooden support. After the introduction in Italy of slow-drying oil paints from the North, like other painters he took advantage of oils’ colorist pliancy. As the century wore on, paintings destined for exercises of piety turned more to the epic, sumptuary, public narratives that were already filling Venice’s churches and confraternities. Bellini would paint these, too, grandly paint them, as witness his altarpieces in San Zaccaria and the Frari. The Getty show features only 12 smallish pictures, but it’s a precious event to have all these in one place so close to home. Pisanello cutting of letter "S." An armored Paul tumbles gracelessly, helplessly, from his horse. Bellini’s holy figures possess an ineffable tenderness and interiority. His Saint Dominic lives deeply inside himself, as if in constant review of a tested, vigilant inner life. He’s pictured reading a large book with such attentiveness and contentment that he dramatizes the deepest spiritual pleasures of the act of reading. And in Virgin and Child with Saint John the Baptist and a Female Saint in a Landscape (from 1501), Mary looks down on the infant in her lap with a resigned heaviness that tells us she knows she’s sadly prepared to surrender her child for sacrifice. Her context is the rest of the world: the landscape behind her is composed of city, sea, ship, fields, shepherds, which don’t just provide a worldly topography of creation but a directory of life functions, of commerce, fertility, provisioning, sponsorship and overseeing. Eve’s body rises from Adam’s rib, one leg still half-sunken in his torso. In Bellini’s crucifixion scenes, we see him picture to picture experimenting with the dilating or contracting of space. Every degree calculates an emotional effect. In one scene Christ isn’t embedded in a quotidian natural environment or made one more object in nature’s landscapes, he’s offered up in his agonized solitude on the rocky sacrificial altar of Golgotha. He looks abandoned and, as his sweaty face and bloody head testify, drained of hope. It’s a terrible image of lost-ness. In Crucifixion with Virgin, Bellini’s interest doesn’t lie so much in sacred story as in the streaming of life behind the Passion event. It’s an essay on the relation of sacred story to the physical reality of the natural order, which reminds us of Christ as an event in history, an action among us, not a mere object of veneration. Bellini’s globalizing vision pulls it all together in one scene in consciousness. The freshness of his landscapes enacts fresh beginnings. Landscape, with its plain fresh beauties and symbolic resonance, figures in the Getty’s companion exhibition, Sacred Landscapes: Nature in Renaissance Manuscripts (ends January 7, 2018), an intense, compact tour of book illustrations from France, Italy, and the Netherlands more or less contemporaneous with Bellini’s career. Wealthy patrons commissioned Books of Hours, illustrated prayer books wherein a needy or troubled mind might find shelter, direction, solace. The exhibition includes imagery from one made for a young woman named Denise Poncher. An illustration shows her kneeling, prayer book in hand, before an extremely tall, worm-infested, skin-raggedy skeleton bestriding three recent victims. It’s a terrifying picture and reminds us how not far we’ve come, in the popular imagination at least, from our envisioning of death, who is grinning and wielding several scythes: one blade curls around the kneeling Denise’s head like a dreadful lure that would swipe her away from the lush life-burst of vegetation around her. In another (Noli mi tangere), she’s met by the risen Christ, bloody but dressed in crown and robes of a gold that threads through the pious girl’s tresses and spangles the natural world in which both figures are set. Everything looks touched and shockingly changed by the Redeemer’s bloody sacrifice. I have two personal pocket-sized favorites in Sacred Landscapes. A tiny (5˝x3˝) cutting of the letter “S,” from a gradual attributed to Pisanello dated 1440–1450, dramatizes the conversion of St. Paul. In the image’s upper hemisphere an opulently attired noble in an imperial red turban and livery rides confidently with two soldiers; in the lower hemisphere, in the lower crook of the “S,” an armored Paul tumbles gracelessly, helplessly, from his horse. And in a creation scene from a prayer book, in a field of lilies, irises, roses, and an intensely green scaly date palm, Eve’s body rises from Adam’s rib, one leg still half-sunken in his torso. She’s stepping out. In the background we see them as it were a minute later, the two reaching for forbidden fruit, then a little deeper in the small (7˝x4˝) scene they’re being expelled from the garden, and highest in the scene are their sons offering sacrifice. These, too, are beginnings — inauspicious ones.